Hi! 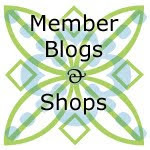 My name is Alyssa and I am a Quilting Addict. I am new here and new to quilting. After having only recently finished my first quilt, and having learned a lot along the way, I will bring a little comic relief to the blog post this week. 1. When Nikol has the fantastic idea to submit quilts into the State Fair... don’t get all excited and agree to participate. Especially when they are due in 5 weeks and you are going on a 2-1/2 week holiday. So yes... That means you have 2-1/2 weeks to complete said quilt. 2. 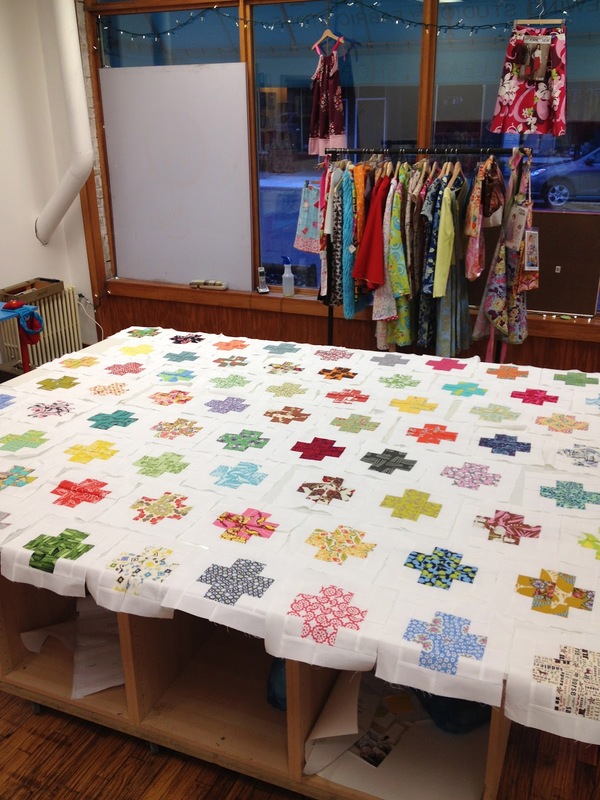 Piecing a 76 different fabric log cabin style quilt is a lot of work. One block at a time. 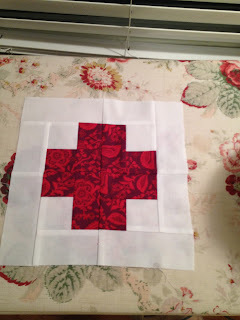 Oh and Ps.... Red Cross! Hahaha! I thought this was hilarious when I was ironing it at 2 am... it was pretty funny.. at least I thought so... uh.. moving on. 4. Piecing a 76 fabric quilt is a lot of work. Maybe I said this before. I might have forgotten the in 2-1/2 weeks part though. 6. Now it was time to lay out... Do you realize when you have 75 different fabric blocks you can move them around forever and not ever be totally at peace? Nikol and I looked and moved and looked and moved... and then moved some more... till our eyes were buggy. 7. I’ll be honest at this point I did come to tears... I had been sewing non-stop for days and I had decided to make the quilt bigger to fit my bed... After looking and moving a lot, I realized that the rows weren’t making sense to what it should be.. This is the point where the creative needs to stop and you bring in the accountant. So, my accountant friend came over to see what I was doing and he did some quick math to realize I had too many blocks in each row and that by moving all those blocks I would have the right number of rows. Smart one, he is. 8. Back to that wonderful seaming technique... sewing the blocks into rows... more seams to line up! Ok.. this wasn’t so bad.... actually making the rows was quite fun as I had now officially made new fabric! 9. But then.... those pesky rows need to go together to make the quilt top.... which means more seams only from both directions. There was nothing fun about this and my OCD did have to go out the window a bit.. but only a bit. Oh.. and post-it's are fabulous for keeping track of where everything goes! 11. Have I mentioned yet that piecing a 76 fabric log cabin style quilt is a lot of work? You may have forgotten along the way as this is a long story, so I should mention it again. 13.. You’ll note the back... that is one heck of a lot of pieces... Oye. There are days when I still want to see the back to be honest... it was really pretty amazing. 14. Ok... one more thing I had to learn twice.... buy extra fabric of the main! I did a measure once cut wrong... not a measure twice cut once... for the two large pieces of white on the back.... so, back to Glad’s as we were still waiting for the Kona to come in at Sewtropolis. 15. Well, now to put this bad boy together. 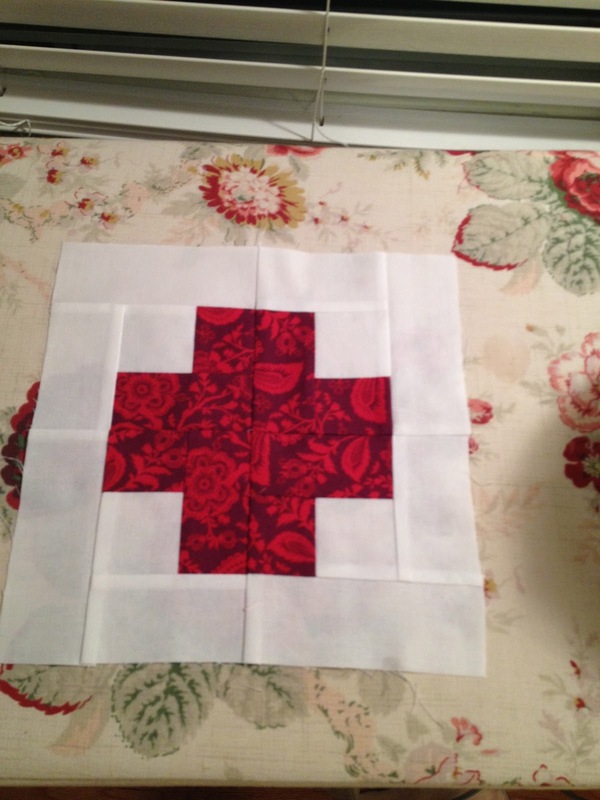 I had pieced the back.. Wow, does one giant cross and 2 giant panels go together quickly! Much fast than the quilt top! So... I bring it over to the shop.. because of course, I cannot do this alone.. I need the quilting expert by my side and not just on the phone... Plus,she has this really fantastic big table in the back of her shop which is perfect for pinning a quilt together. 17. Yes.. now to go home and quilt this bad boy. I get home.. and get nervous.. What do I do? Yep, call Nikol... Pretty sure she was getting excited this quilt was coming to a close at this point with all my late night calling and texting.. :) So, she suggests a walking foot. A what? I sew on a 1970’s Riccar with a normal foot, a zipper foot and and a buttonhole foot. Oh, but wait... I just bought my daughter a new machine.. I bet it came with a walking foot.. Phew! It did. So, Ricky had to sit this one out. 18. Moving on. Stitching in the ditch is a lot of work. I thought piecing was but boy was I ever wrong. 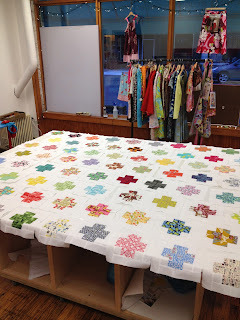 :) Just think I still have to sew on 75 buttons for the final quilting. 19. Have you ever sewed 75 buttons onto a quilt? I can tell you that is what a thimble was made for. I had not ever needed to use one until this point.. Stab your self a few times and you will want one too. Blood on the quilt is hard to get out when one is not going to wash the whole thing... this fact has been proven. So now you can see, blood, sweat and tears went into this bad boy. Oh and in case you were wondering what my daughter was doing while I was sewing on 75 buttons.. (because of course it was easier on the big table..) Yup.. she was downstairs on her hands and knees scrubbing the floor at Sewtropolis. Seriously. Now, if I could just get her to do that at home! 20. 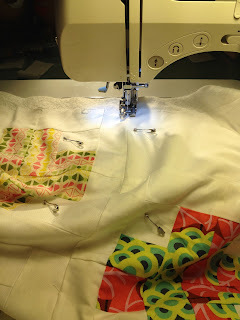 So once you have all the quilting done it is time to bind... I started my binding at 2 am, The quilt was due at 9:30 at the State Fair grounds. You may have missed this... but this was my first quilt. Meaning I have never bound a quilt before. This was by far the worst detail on my finished quilt. Why you ask? Because it was 2 am and Nikol my quilting guide was in bed! 21. First problem, how does one manage 12 yards of bias? I thinking I mentioned I am slightly OCD... if not.. now you know... Here is what I came up with at 2:30 am. Good idea, right? I thought so, too! 23. Well, by 5 am I had a finished quilt. The best part I think was being wrapped up in it while sewing on the binding and being all cozy. It is a beautiful quilt! 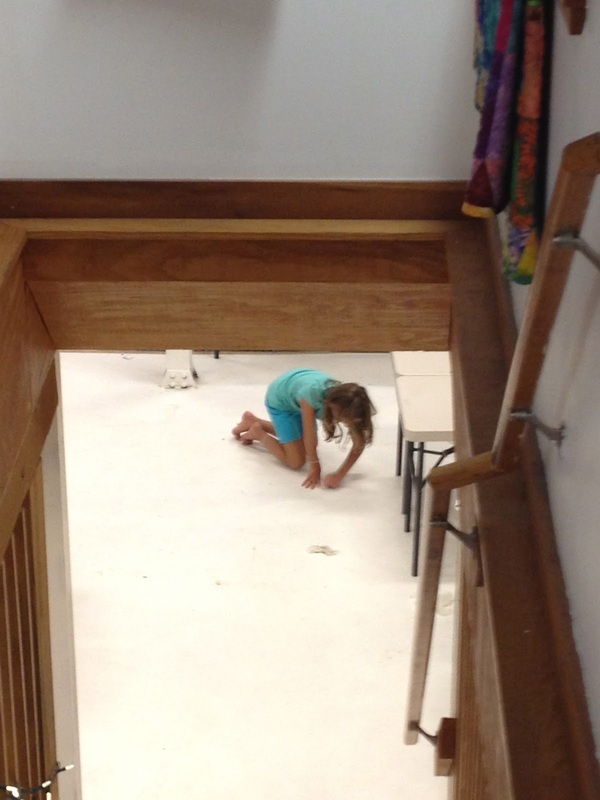 Some learn best under pressure and/or a time crunch...a lot like studying for finals! Keep up the great work. You make me wanna learn about quilting, Alyssa. I love sewing, yup part of it bcoz my mom made me doing all the cutting pieces when i was...err in Standard 4 i guess. All for my sisters' and my new "baju kurung" for our celebration every year then. Your story really has opened up my heart to the quilt things. So, from your experience, where and how should i start? Entertaining story. 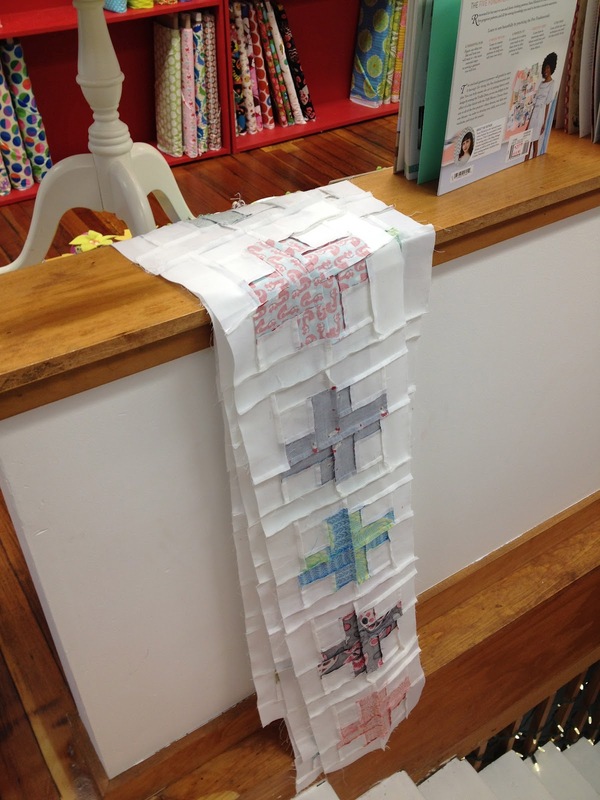 The rest of your quilting should be a piece of cake!